While you guys are mulling that one over, let me catch you up on Beit Shean. In a country that is chock full of archaeological sites, Beit Shean is definitely one of the most impressive. 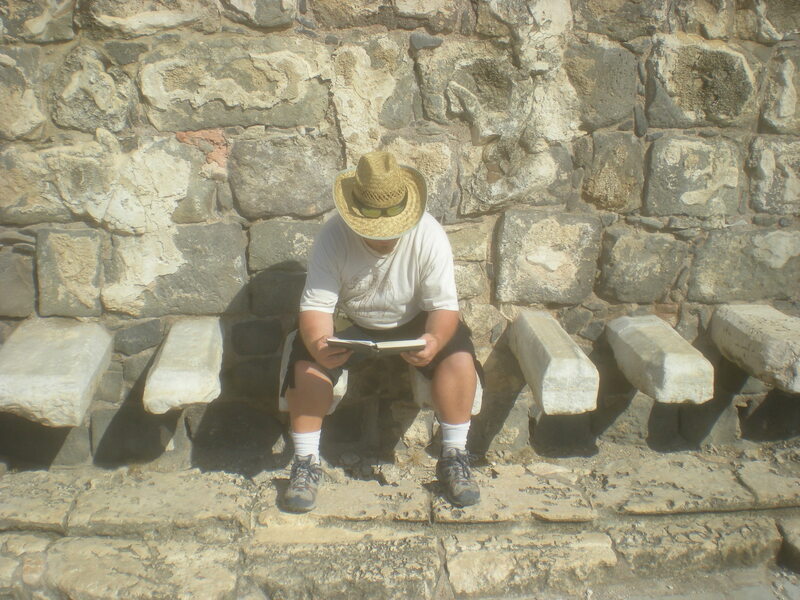 Beit Shean is the location of an old and important city, and offers a window onto the various cultures that have ruled here over the millenia as well as an understanding of the specific geography of the Land of Israel. The remains on the tell of Beit Shean date as far back as the Neolithic Period (about 7000 years ago), but also include Canaanite, Egyptian and Israelite finds, among others. There are not many places in Israel (or perhaps in the world) where you can see what an ancient Roman city looked like. They were all laid out on a similar pattern, including a major north-south road (called a Cardo), a major east-west road (called a Decumanus), and many other common features including a theater, an amphitheater (not the same thing, but more on that a different time), a hippodrome, a forum, a central fountain (called a Nymphaeum) and plenty of temples. While Beit Shean is far from 100% excavated, it is still quite easy to get the general feel for the city’s urban planning and major architectural features. I’ll be honest. To me, the site is much more impressive from a distance than when you get into it. But maybe that’s just because I know what to compare it to. Before I first visited Beit Shean, I had already been to Tzippori (Sepphoris) a few times. And the details that you see in Tzippori are so much more beautiful and impressive than those at Beit Shean. Maybe it is because I love mosaics, and there are so many gorgeous ones at Tzippori (perhaps the most beautiful ones in Israel) that I am partial. But I think of you visit Beit Shean first (or only), you will be quite pleased with what you see. A few of the highlights at Beit Shean include a massive bathhouse (the largest of its kind that I have seen in Israel), a large theater and many temples. You can even see an ancient Roman latrine, right next to one of the temples! One of the main reasons that Beit Shean is so impressive is its sheer size. At its peak, during the Byzantine era, the city reached nearly 50,000 residents. And even before then, it was often one of the most important and sizable cities in the region. The main reason for this is the geography of the area. Beit Shean overlooks the Jordan Valley, on the eastern side of Israel. That valley is a massive rift between two tectonic plates, thus creating a giant gash in the Earth with cliffs on both sides. Thus, anyone who wants to descend into the valley needs to find a way out of those cliffs. There are a few places in Israel that due to different types of rock, and/or major erosion patterns, there are smoother, natural passes out of the mountains into the valley, rather than steep cliffs. One such pass is next to Jericho, on the way down from Jerusalem. But an even more major one is located at Beit Shean. To the west of Beit Shean, one may find a series of valleys (sometimes referred to as the Great Central Valleys of the country) that formed via erosion running from the area of the Mediterranean down to the Jordan Valley. The most famous of these east-west valleys is the Jezreel Valley. Because of the size of this drainage area, the pass to the Jordan Valley is actually quite large, creating an area that stretches south and west from the city of Beit Shean in a roughly square area called the Beit Shean Valley. In this part of the Jordan Valley, the cliffs to the west side have basically been completely eroded away. In ancient times, the main route that traversed Israel, carrying traffic between Egypt to our southwest and Mesopotamia to our northeast, came up the western side of the country. But once they reached the area of the Carmel Mountain, travelers would cross eastward through the Jezreel Valley, and then continue northward. One of the two major turns north happened right here, at Beit Shean. 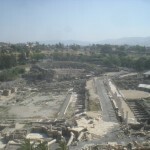 Beit Shean’s geography also made it a prime spot for a city even without considering its important location on a major crossroads. It is situated between two major streams. The Beit Shean Valley to its south also features numerous springs that formed due to the prehistoric erosion patterns. Rich alluvial soil has also been deposited there over the millenia by the various rivers that flowed through and into the valley. So there is plenty of water and food to support a city in this location. I find it quite interesting that the geology of Israel created both the key geographical locations for ancient cities and the paths of the ancient roads. And it is even more interesting that today’s roads remain in the same places, and many of the country’s cities are also in the same places they were. 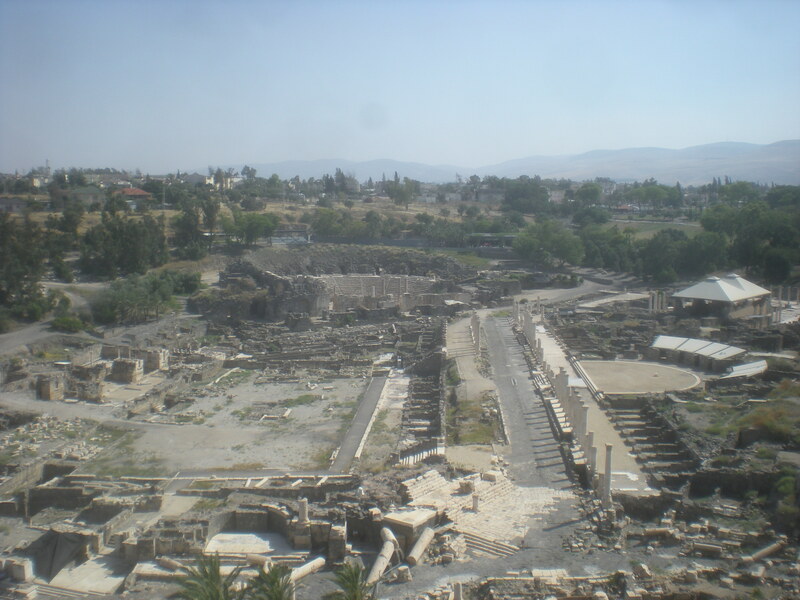 A visit to Beit Shean is well worth the trip for anyone who is interested in archaeology, history or architecture. But it is also an excellent place to understand why the history of this land developed the way it did. That’s an easy one for me because I did my miluim at the “Hilton”, the tall building you see through the hole in the wall made by an artillery shell. 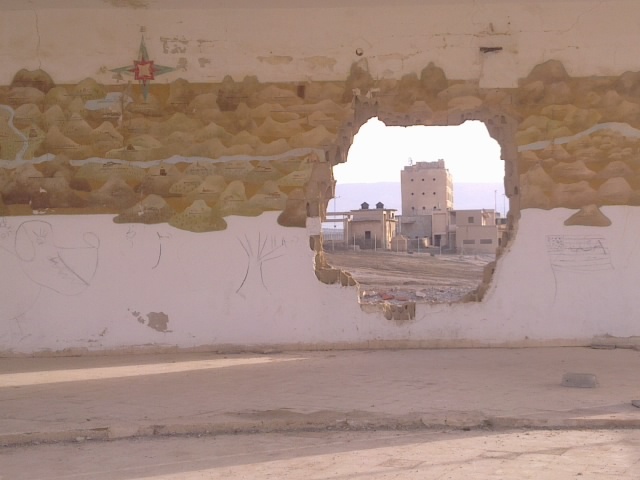 It was a reserve soldier that painted the Crusader map on the walls of what had been a Jordanian restaurant with a view of the Dead Sea. Great place to show tourists and a good reason to hire a guide. its from the old jordanian officer’s club house near the dead sea…what do i win???? This is near the intersection of Highway 1 and Highway 90 by the Beit Ha’arava Junction. It’s about 100 meters North of the intersection. There you’ll see a ruined building with a mural painted on the wall. It was painted in 1973 and it’s a Crusader map depicting the land of Israel. The structure itself was once the fancy shmancy Lido Cafe – active at the turn of the last century and catering to wealthy clients from Jerusalem and Jericho. The Dead Sea used to come right up to it but has since shrunk. A lot. It’s kind of scary. The building nearby was a Hotel and now it’s an army base nicknamed the Hilton. Are there prizes available for naming the spot of the Mystery Photo? That’ll be the old Lido social hall on the Northern coast of the Dead Sea, looking through a hole in the wall at an Israeli army post. Ok this one is not really fair. Anyone who has been there will know right away that it is the old Lido building by the northern part of the Dead Sea. If you haven’t been there, you will of course have no idea.